A pretty large oval shaped, white glass and clear rhinestone studded ring. The oval shaped front of the ring is set with alternate wavy lines of white milk glass seed beads and clear rhinestones. The ring is formed from a silver tone metal. A lovely vintage ring in excellent condition. Striking large oval ring, circa 1980's. Vintage White Milk Glass Button Clip On Earrings. Vintage white milk glass, clip on button earrings. 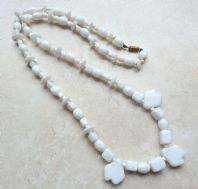 Vintage milk glass bead necklace, with discs, oval and heart shaped beads.